During a routine drug investigation which resulted in the beating of a handcuffed suspect, a new leader in the fight against police corruption came to light. His name is Joe Crystal. On 27 October 2011 in the city of Baltimore, Maryland : Baltimore Police Detective Joe Crystal, Department Sergeant Marinos Gialamas, along with Detective Keith Tiedemann, were on duty together in a single vehicle near Prentiss Place, when they observed what appeared to be suspicious drug related activities. As police were approaching the scene, suspect Antoine Green attempted to avoid arrest by running, then concealing himself in what he believed to be an abandoned home on Prentiss Place. He tossed his bag of drugs over a fence along the way. Unfortunately for him, the home he entered was inhabited by Nakishia Epps, who was, at the time, the girlfriend of another Baltimore Police Officer, Anthony Williams. Williams was off-duty that day. Upon hearing someone enter her home, Epps hid in her room with her child and called 911. She also called her boyfriend, Officer Williams. Gialamas had conspired with Officer Williams, and together they had made a decision to have the arresting officers return the already apprehended and cuffed suspect back to the Prentiss address, where Williams had arrived in response to his girlfriend’s call. Detective Keith Tiedemann, in his ‘‘Statement of Probable Cause’ filed in reference to this case, suggests that the reason for bringing Antoine Green back to the arresting location was the suspect’s aim to apologize to Officer Williams’ girlfriend, whose home Green had invaded. In the Statement, Tiedemann seems to suggest that Antoine Green beat himself up. He also claims to have witnessed Green victimizing himself. However, Det. Tiedemann had not accompanied Green into the back of the home, so could not have witnessed what occurred in that part of the house. During his interview with the state’s attorney’s office, Det. 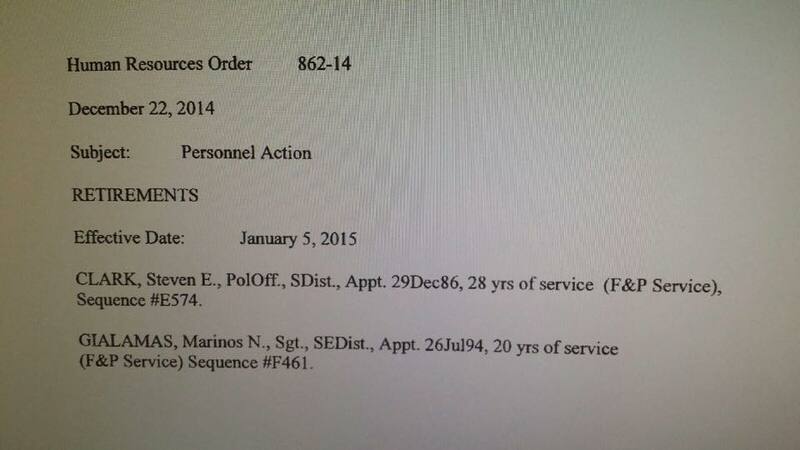 Tiedemann claimed that Sgt. Gialamas had instructed him to state in the report that Green’s shirt was torn prior to being transferred back into the house. Tiedemann later perjured himself in court by claiming that he believed the report he wrote was accurate, even though he had already admitted to the ASA that the report had been doctored according to instructions by Gialamas. It seems that, when Det. Gialamas was instructing Det. 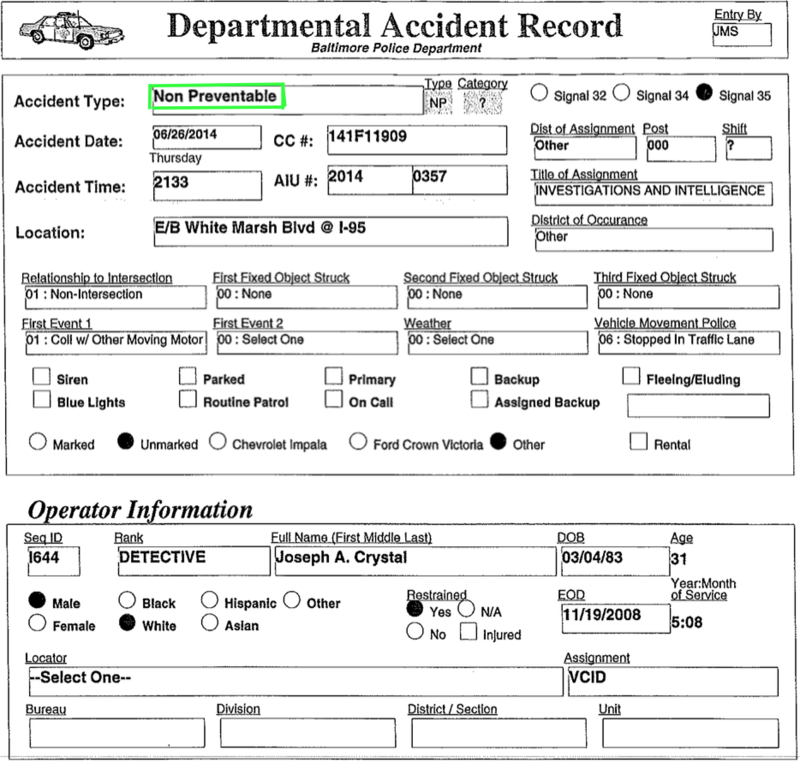 Tiedemann to edit the report, he failed to notice the second reference to the torn shirt. Thus, not only were Det. Tiedemann’s claims in the report and to the court contradictory, Tiedemann also contradicts himself within the body of his own Statement of Probable Cause. During the pursuit of Antoine Green, Tiedemann remained at the Prentiss address, and Det. Crystal was standing by, awaiting assistance to retrieve the tossed bag of drugs from the other side of a construction fence. After Det. Crystal received assistance with recovery of the drugs, he was taken to the home of Epps only moments prior to Green being placed into the wagon. Crystal was present when Green was being delivered back to the scene. He saw that Green’s shirt was not torn before being taken back into the house. Green was taken into a back room. Detectives Crystal and Tiedemann remained at the front of the house to secure the location, as a crowd of neighbors gathered to witness the unfolding events. Crystal saw, when Green emerged, that he had been roughed up and that his shirt had been torn after being taken in, and before exiting the house. To reiterate : Det. Tiedemann could not have seen what he described in his report, because he remained at the front the house after Antoine Green was taken to the back to receive his beating. Tiedemann’s father, who shares the same name, is a retired Major in Internal Affairs for the Baltimore PD. This might explain why Det. Tiedemann was not charged with committing perjury. What actually occurred at Prentiss Place was abuse of authority and aggravated assault & battery on Green by Williams and Gialamas. Neither were ever charged with the conspiracy to commit this crime. Neither were charged with abuse of authority. All charges against Antoine Green, as related to this incident, were dropped. Three years later, in February 2014, a jury found that Officer Williams and Sgt. Gialamas had committed criminal acts in their treatment of Green. In what is commonly seen as a dangerous choice, Detective Joe Crystal told only the truth in his attempt to report the Antoine Green incident to another sergeant by the name of Robert Amador. Sgt. Amador warned Det. Crystal that if Crystal went to Internal Affairs about this issue, he would be labeled a snitch and it would be the end of his career. Because of this warning, Crystal filed his complaint directly with Assistant State’s Attorney Anna Mantegna, bypassing Internal Affairs. Frank Serpico was the original police whistleblower, and became famous for doing this back in the early nineteen seventies. While others before him had tried to out corruption, Serpico was the first who succeeded to the point of being noticed by the press and, in turn, the system. His story was told by Hollywood. Serpico joined the ranks of the New York City Police Department in 1960. After years of attempting to get fellow and superior officers and the city to address rampant corruption in the department, ‘Serpico finally was able to testify to the Knapp Commission in 1972, becoming the first policeman to voluntarily testify against a fellow officer. He paid for his perceived disloyalty to the force — other officers refused to come to his aid when he was shot during a drug raid in 1971.’ He was given an award, but never truly honored for his sacrifice. The resulting Knapp Commission Report reveals a frightening depth of corruption in the NYCPD up until the nineteen seventies. In spite of efforts by Frank Serpico and the Knapp Commission, the corruption continues to this day in police agencies around the country, with the gang known as NYPD leading the pack. A Village Voice article published in 1973 by Adam Walinsky lays out the Serpico story well. A more recent Village Voice series of articles gives an in-depth view of the experiences of NYPD whistleblower Adrian Schoolcraft, who was kidnapped by his superior officer and forcibly removed from his home and deposited in a mental health institution against his will for working to report corruption at NYPD. Schoolcraft testified in the 2013 lawsuit against NYPD for using what has now been ruled unconstitutional stop & frisk policy. In October 2011, Florida Highway Patrol Trooper Donna Jane Watts stopped and arrested Miami Police Department officer Fausto Lopez, after she clocked his patrol car speed at 120 mph. ‘Over 80 officers from 25 agencies accessed Watts’ private information’ in efforts to intimidate her for taking action and making the appropriate report against Lopez. 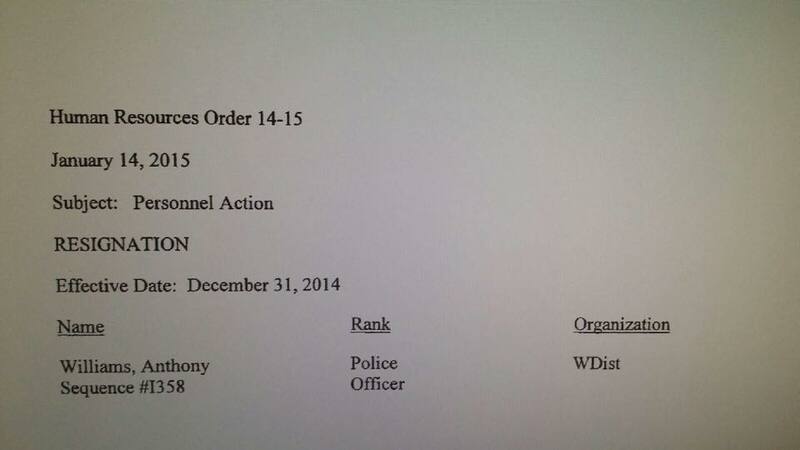 Watts has filed suit against each of those officers and their departments. On 9 August 2006, retired Albuquerque officer Samson Costales, Patrolman 1st Class, testified against Bernalillo County deputies for using excessive force on Al Unser, Sr. near a SWAT roadblock Unser had happened by. Costales ‘claims in a federal civil rights lawsuit filed Thursday [23 August 2007] that APD Chief Ray Schultz, Sheriff Darren White and James Badway, an APD officer and police union official, defamed, slandered and retaliated against him after his testimony. A jury ruled in favor of Costales in his case against APD, and settlement in favor of Costales was reached with APOA (police association) and the Bernalillo County Sheriff. Costales was recently present, along with several elected representatives, at protests against APD for their shooting and killing homeless victim James Boyd. The day after charges were filed against Perez and Sandy, Deputy City Attorney Kathryn Levy refused to allow Chief Deputy DA Sylvia Martinez to participate in a meeting regarding a more recent shooting by APD officers. Her claim is that, having filed murder charges against two other APD officers, the District Attorney’s office has a conflict of interest, and cannot be involved in any investigations of other APD officers. In April 2014, ‘Louisville [Kentucky] Metro Government … agreed to pay $450,000 to … former police detective [Barron Morgan] who says he was demoted to patrol officer on the graveyard shift for trying to help an imprisoned woman prove her innocence on a homicide charge. Eight years after the crime was committed, Susan Jean King, in fear of being sentenced to life without parole, had pleaded guilty to the 1998 murder of Kyle ‘Deanie’ Breeden. In the plea deal, she had been sentenced to ‘only’ ten years, with possibility of parole after serving two. Finally, three years after the Baltimore Police attack on Antoine Green, the cases against the two Baltimore officers went before juries. Officer Anthony Williams was recently found guilty of second-degree assault and obstructing and hindering the Internal Affairs investigation. With a possible ten year sentence for second degree assault, Judge M. Brooke Murdock handed down a year long jail sentence, then reduced it by suspending ten months and fifteen days. The sentence was effectively reduced to 45 days of incarceration for conspiring to and committing assault & battery against a person in custody. The jury found Sergeant Marinos Gialamas guilty of one of three charges of misconduct. Gialamas was found not guilty of assault. The official records of the Maryland Judiciary Case Search website, inconsistent with media reports, show that Sergeant Gialamas was subjected to ‘probation before judgement’ on the charge of misconduct in office. The case against Gialamas, having been closed on 5 July 2014, shows that the jury’s judgement was reversed by Judge M. Brooke Murdock on 6 November 2014, four months later. The dates on the state’s website report show the case called ‘closed’ on 5 July, disposition and guilty verdict stricken both on the same day, 6 November. This judge overturned the decision made by the jury. Though he conspired to deliver Antoine Green to the off-duty Williams for a beat down, Sgt. Gialamas, unlike Officer Williams, received support from the police union. The union paid for Gialamas’ defense, and produced union president Robert F. Cherry, Jr. as a character witness. Cherry testified that the sergeant should retain his job. Williams had to pay for his own defense, and received no union support. Nearing the end of 2014, more than three years after conspiring to assault and assaulting a person in custody, both officers were still working for Baltimore Police Department. However, documents now reveal that both Marinos Gialamas and Anthony Williams recently resigned. Fitting with the confusion evident in state records regarding the court cases against these two men, the resignation order for Williams is dated 14 January 2015, citing effective date 31 December 2014. The document was issued fifteen days after his resignation was effective. Gialamas will apparently be collecting his pension, after having been found guilty in a court of law for participating in violence against a handcuffed prisoner. Joe Crystal kept a journal documenting the abuse he was suffering. Crystal continued to receive harassment from within his own precinct, so he approached FOP President Cherry seeking support. Cherry offered none. The union president wouldn’t even look at Crystal’s journal . Joe Crystal has embarked upon a journey of truth telling in a realm where deceit and corruption are the norm. Having been a key witness to the abuse of Antione Green by Officer Williams and Sergeant Gialamas in 2011, Detective Crystal exhibited the moral integrity and courage in an insidious environment, a system which adheres to an unnatural silence pertaining to violence and various other forms of illegal conduct by police. His act of honesty led to years of harassment and threats by other police officers. While there were several other officers who were supporting and encouraging Crystal to keep pushing for the truth to be revealed, Det. Crystal mostly experienced obstruction, threats, and retaliation by fellow and superior officers alike, including from within the office of Internal Affairs. While Internal Affairs personnel claimed to be investigating the misconduct reported by Crystal, they never even took a statement from him until mid-summer of 2014, three years after he had begun reporting the harassment. Protocol dictates that no investigation can occur without an initial complaining statement. During his tenure at Baltimore PD, Detective Crystal was a Class Commander at the police academy, and received a Police Commissioner’s Award for his leadership skills. Having been promoted in 2010 (only a year after graduating the Police Academy) from Officer to Detective, and in direct contradiction to the respect he had earned, Crystal was now being threatened and harassed. Detective Crystal had been warned that, by doing the right thing and telling the truth, the harassment would follow him throughout his career. Before and after testifying against Gialamas and Williams, Detective Crystal regularly received offhand remarks about cheese and rats from fellow officers within the precinct. He was called a rat and a snitch. In one day, Sgt. John Burns delivered several pictures of cheese and rats, on post-it notes, to Crystal’s desk. Various fellow officers engaged in taunting him, with Det. Calvin Moss stating, “Are you having a cheese party? I know rats like cheese.” Crystal was also harassed at home. Crystal was warned, “You better pray to god you are not the star witness.” Crystal was told to watch his back. Sgt. Amador was ordering Crystal to falsify documents. Crystal was acutely aware of the ramifications if caught committing any act of misconduct. Such a violation would make him ineligible to testify in court against Gialamas and Williams. Concerned that his superior officer might falsify the documents himself, Det. Crystal photocopied the documents before returning them, along with the $100 he was coerced into giving Amador in cash. Amador tore up the original documents after receiving the money, and did not supply Crystal with a receipt. In November 2012, soon after showing the journal to ASA Shelly Glenn in the state’s attorney office (which by now included the fact that Amador had ordered Crystal to falsify documents) a rat appeared on Crystal’s car with its head under the windshield wiper and its guts torn out. Shelly Glenn had replaced ASA Jan Bledsoe, who who had resigned mid-investigation under threat of being fired relative to a separate issue. Glenn was good friends with the wife of Sgt. Amador. Det. 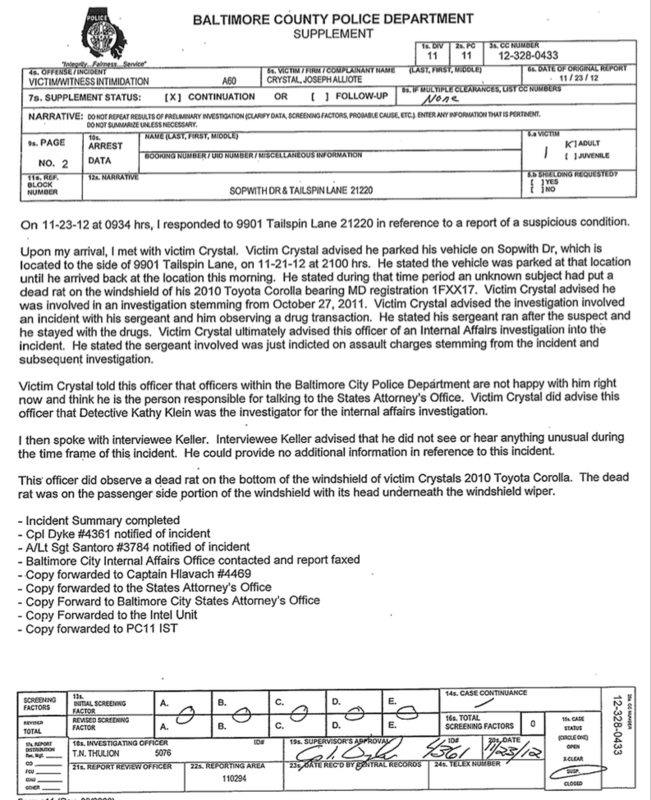 Crystal filed a police report about the rat, but there was never any actual investigation. The case is referred to as #ratgate because of this particular action. The harassment quickly manifested into actions which put Joe Crystal’s life in danger, including, as had occurred decades earlier to Frank Serpico, fellow officers refusing to have Crystal’s back in dangerous situations. At the end of May, 2012, Detective Crystal lost out on a new assignment in the VRO Squad (violent repeat offender) based upon, according to Lt. M. Fries, his perceived inability to work ‘in the gray area.’ He was effectively being punished by the department for his integrity. While on duty, routine calls for back-up were not dispatched. Detective Crystal feared for his safety by November, 2012. In return for having displayed honor and dedication to justice by upholding his oath as a police officer, Detective Joe Crystal was rewarded with threats and retaliation from co-workers and superior officers. 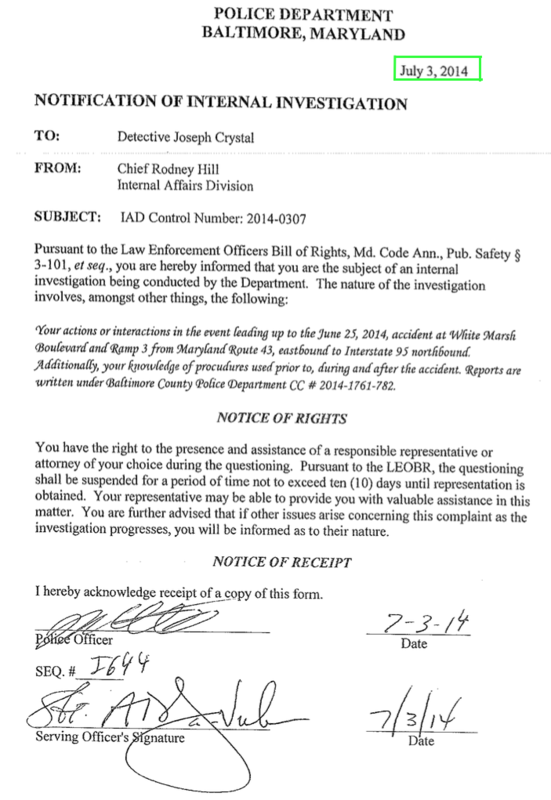 Having failed to support Crystal as a whistleblower, Baltimore Police Commissioner Anthony Batts eventually requested assistance from outside investigators. In June 2014, two investigators from Philadelphia PD and two from Montgomery County were assigned, but quickly got off course by opening internal investigations into some of Det. Crystal’s allies. Crystal’s attorney, Nick Panteleakis, said, “… some of Crystal’s allies who have been interviewed by the investigators were labeled ‘suspects’ and the agency opened internal complaints against them, which upset the officers and Crystal. … We said, “That’s not correct, we don’t want open [Internal Affairs] complaints against them.” but they said, “We’re going to keep them open.” Those cases are still open Internal Affairs investigations. Unfortunately, the investigation didn’t even begin until after the statute of limitation had run out on the offense of the rat on the car, and on any other potential misconduct related to this story. Conditions escalated. Det. Crystal lost his hard-earned security clearance. He was assigned to cases where instructions from supervisors were confusing and often contradictory, and also bounced from one assignment to another with little to no choice nor explanation. Being subjected to this campaign of attrition : knowing that without proper procedures being followed by fellow officers, and without support from his department, Joe Crystal realized he could not safely continue to serve the public. Not only were the actions of his co-workers dangerous for Det. Crystal, the willingness of his fellow officers to leave him hanging, without backup, also endangered the public. Having not bothered to do any serious internal investigations into the misconduct by officers in retaliation against Det. Crystal regarding his testimony against Gialamas and Williams, Internal Affairs made time in a hurry to target him in an internal investigation for the misuse of a police vehicle. However, IA used the opportunity to harass Crystal even more by attempting to sully his record for having allowed his wife to ride in the vehicle. 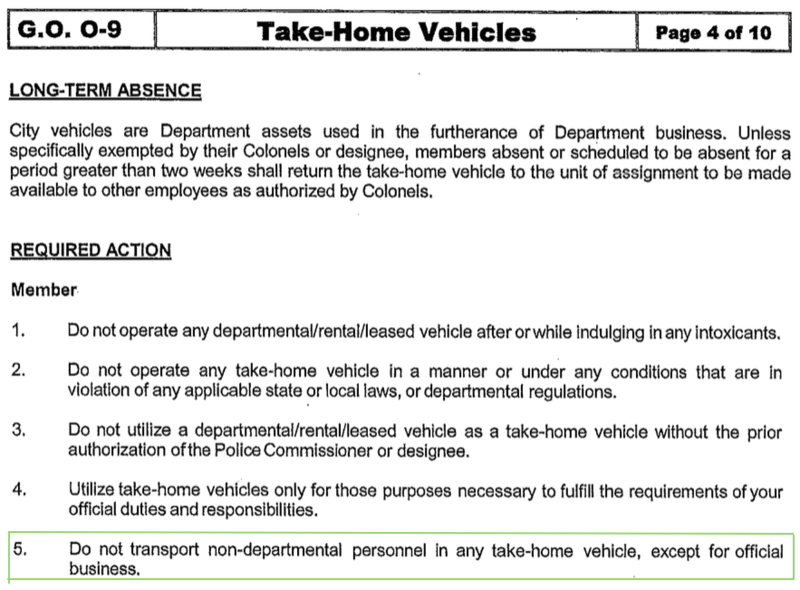 At the time of the incident, there was no actual General Order prohibiting a spouse from riding in an official vehicle. After waiting three years for Internal Affairs to investigate harassment and threats against him with no response, Crystal was forced to sign a notice of investigation six days after this incident. 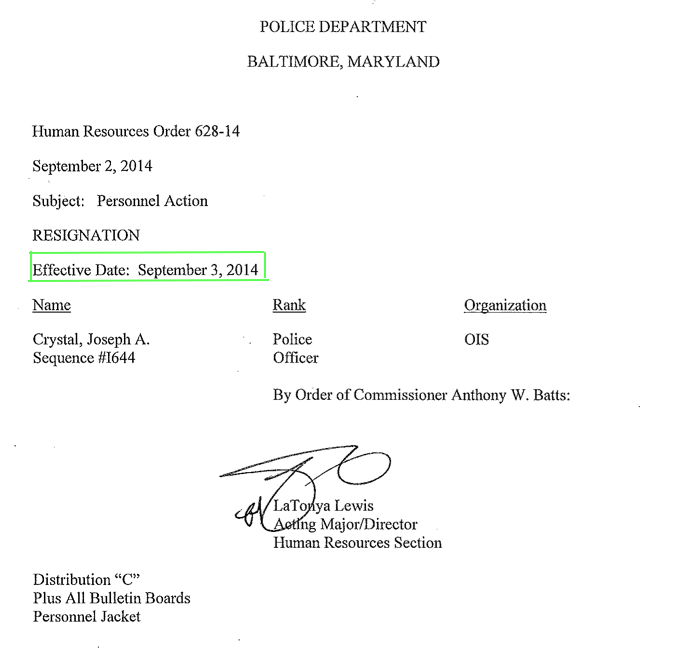 Crystal had already resigned from Baltimore PD, effective the previous day, 3 September 2014, after refusing to sign a proposed Settlement and Release Agreement. Joe Crystal has been in the news lately, telling his story. This entry was posted in corruption, history, information, news, police brutality, true stories and tagged adrian schoolcraft, anthony williams, baltimore police, barron morgan, cariol horne, donna jane watts, fausto lopez, frank serpico, innocence project, james boyd, joe crystal, keith tiedemann, lobstergate, marinos gialamas, nakishia epps, prentiss place, ratgate, robert f. cherry, samson costales, serpico, snitch, stop & frisk, susan jean king, whistleblower, whistlepig on January 22, 2015 by wiseoldsnail.